We're pleased to present this guest post by Teddy Hunt. Read on for concrete ways that B2B marketers can work Pinterest into the mix with good effect. The concept of social media being used in B2B marketing strategies has simply exploded in recent years. Some marketers hopped on the bandwagon years ago and have perfected the art; others are just coming around to the idea, and still fewer utilize the power that is Pinterest. 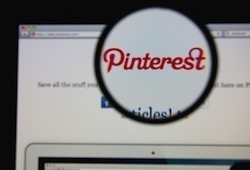 Pinterest is a unique form of social media through which users share (or “pin”) content they find throughout the web to virtual bulletin boards. It’s a great way for people to share ideas with each other about projects, plan events, share recipes and words of wisdom, and simply express themselves. Users typically organize their pins by assigning a certain theme to each board, which also makes it easier to sort through. Twitter and Facebook certainly dominate in the social media marketing atmosphere, but there's plenty of room for Pinterest too. Here are some ways you can grow your business through the powers of Pinterest. The world of social media seems to move faster than the real world. Pinterest is no exception. If your goal is to build up your business's visibility and brand image, you'll need to get into a groove of pinning daily. These daily pins will establish your credibility and make your page more appealing to users than one that pins sporadically. To maximize the pins you make every day, plan on making daily or weekly themes that are relevant to your brand image. This way, your business followers will have access to new and interesting content that will keep them engaged with your work, but also keep your brand at the forefront of content as it relates to their world. Interact with followers and other businesses by sharing their relevant pins and commenting on threads. One of the easiest ways to stay current is to align your goals with those of other innovative companies. Do this by pulling inspiration from their conceptual successes; question the status quo. Pinterest is a great place to experiment with your advertising initiatives, since the interface is so closely tied to niches, and it’s so easily adaptable. T-Mobile’s new CEO is listening to his customers, and is really changing things up with the company’s private and business wireless plans. While T-Mobile doesn’t have their own Pinterest account, plenty of their supporters do. T-Mobile monitors the activity and the platform is a lens to what the fans like and an outlet to once again humanize a brand. You can do the same on a smaller scale by using your Pinterest page to engage with your audience and interpret their concerns. If you really focus your energy on interacting and listening to your audience, they may help you pinpoint flaws in your customer service strategies, or your product itself. When it comes to social media, users aren't in the mood to shop. They don't appreciate being pitched products and services while they attempt to peruse their specialized interests. The idea is to blend into their overall user interface, and serve as a resource they can use to find information they're already interested in, which benefits them; seeing that it comes from your company increases their awareness of your brand, which helps you. Chances are your Facebook page is pretty polished and put together, and your Twitter feed is brief and direct. Pinterest is a humanistic platform that flourishes best when human nature is allowed to shine through. One of the best ways to do this is to appeal to the human emotions of empathy, happiness, and nostalgia. A company that does an excellent job of this is Marketo, a company that produces marketing software. The company creates multiple boards to display the company’s culture, and masters the art of nostalgia through the creation of memes that feature pop icons from the 90s and early 2000s Marketo’s Working@Marketo board has 60+ Pins with a direct intent of giving you a glimpse of the people within the organization. You don't have to share details about your personal life. Rather, give your audience insight into the things that make you human. These humanistic posts will be well received, as those things are relatable to people of all walks of life. Don't overlook the importance of sharing new information with your social media following. People engage most with content that educates them about things they wouldn't know otherwise, or otherwise entertains them. It’s okay if the pins directly pertain to your operation, but for the most part, offer information that is useful to your audience but inspires people to want to learn more about your company. Take General Electric (GE), for example. More specifically take a look at their board titled "Badass Machines." This board showcases GE’s ingenuity. It’s creative and leads viewers directly to the company’s homepage, which is a positive side effect of social media. Often the best sources of inspiration come from looking to other pages and drawing from their successes. That's not to say that you should copy what others are doing. Instead, just look at what your competitors are doing and think of ways to look at it from a different angle so that your followers will relate to it. As with many areas of life, if you find yourself struggling, look to successful Pinterest boards for inspiration. Consider how HubSpot generates leads by posting whitepapers, infographics, eBooks, Webinars, and other content on its Pinterest page. Measure traffic. Track your leads. There's no reason your company can't be a social media marketing titan. Just focus on posting relevant, informative content that you've tailored specifically to your audience and your online brand will improve exponentially. Adding Pinterest to your social media strategy will strengthen your brand across the board. About the author: Teddy Hunt is a freelance content writer with a focus on technology. When not behind a computer, Teddy spends the majority of his free time outdoors, exploring the Tampa Bay area, where he currently resides. As I discussed previously mentioned you can recieve mouth watering food items recipes to your diet plans, then you will also recieve PDF reserve with all needed informations that you choose to really need to know so as to abide by total eating plan approach. Savvyb2bmarketing is one of the greatest blog on the web. Very healthy content and easily understandable. I'm very thankful for the writer. Nice post but i wanna know how can i increase my real followers ? Pinterest is very good social media sites.This is very impotent for any business sites sharing. Pinterest sharing is very impotent for any business sites. This site is a good social media sites. Pinterest is very good social media site i like it. hanks for an awesome article! Its very hard to get back your Debt From bad debtors bet a good <a href="http://www.singaporedebtcollection.com.sg/"><b>debt Collection Company</b></a> can get beck your debt. Dapatkan website Anda peringkat atas dengan menggunakan <a href="http://www.jasaseo.com/">SEO Perusahaan Indonesia</a> ans meningkatkan nilai bisnis Anda. Setting up your Yahoo mail account is not a problem anymore! With the Yahoo phone support Number, you can get now the much needed support to set up your contact by just following a few simple steps. When you contact these experts, your call gets connected to a person who is aware of different aspects of how to handle a Yahoo mail account effectively. These people will ensure you to stay away from the work breakdown and help you sort out the problems without any delaying. Pinterest is very interesting and good social media site me and my friends like and using this site. This site sharing is very important for SEO. Pinterest is a free website that requires registration to use. Users can upload, save, sort, and manage images—known as pins—and other media content (e.g., videos and images) through collections known as pinboards. Pinterest acts as a personalized media platform. Users can browse the content of others on the main page. This articles is very interesting and unique me and my friends like this articles. Pinterest is a very good social media site i like this site. This post is really interesting and good me and my friends like this post and pinterest.com site pinterest is a social media site. Thank you for posting. am very happy to know that pakistan moving towards the progress and prossperity. Hello Friends, This post is very good i like this post and pinterest site. Pinterest is a social media site this site is very interesting Me and my friends like pinterest site. Why i can not see my comments ? wow these are amazing tips and i will use them immediately. thanks for sharing. http://nerdypickuplines.com this is really good way to increase traffic. Hy Friends, How are you Pinterest is a very good social media site me and my friends like this site.